I hand craft fountain pens, rollerball pens, ball point pens and a few mechanical pencils from over 220 exotic and domestic woods, literally our products are grown around the world, and made in Arlesey, Bedfordshire. Our pens are ideal presents for occasions such as birthdays, Christmas, weddings, anniversaries, mothers/fathers day and retirement as well as being excellent pens for personal use. An exciting addition to our range is a stylus pen to use with your Ipad or touch screen device. 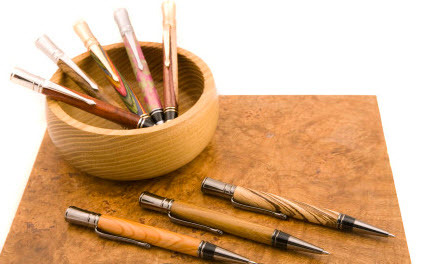 Crafted Pens was born in 2010 and although the collection is still growing the different number of species of woods in stock in our workshop is around two hundred and twenty at March 2015. In the shop area of the website there are a number of pens for sale. If what you are looking for is not there please don’t give up, give me a call, or to be honest email is best as I am frequently away at craft fairs and national exhibitions. To receive our latest offers unique to our subscribers, please add your name and email address below.